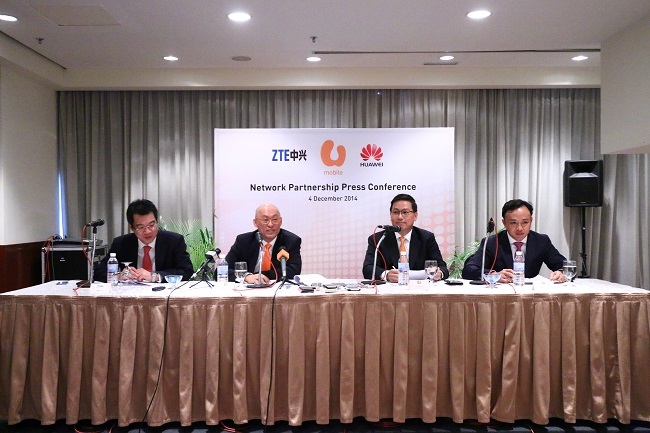 U Mobile has signed a deal with ZTE and Huawei to further improve its network coverage. This is the first of many upcoming plans by U Mobile to be on par with the leading players in the industry by the end of 2015. In order to improve the usage experience of U Mobile subscribers, this partnership will see 1000 3G and 1000 4G network sites built. Construction of these sites is said to cost as much as RM1.5 billion; that’s no small amount. According to U Mobile, ZTE and Huawei were chosen for this partnership due to their expertise in the industry. CEO of ZTE Malaysia, Steven Ge, said that “ZTE is confident that this project will be completed within the provided timeframe.” The CEO of Huawei Malaysia, Abraham Liu, has also expressed its excitement to be a part of the project, saying that Huawei will support U Mobile in their network expansion plans. As it is, U Mobile only has 4G coverage in Puchong, Subang, and Johor Bahru. 3G connectivity, on the other hand, is available in most cities. With this new partnership, the coverage should get much wider while also offering better network quality. Since these sites are still being built, there’s no confirmed dates on when users can begin enjoying improved network coverage. Nonetheless, we’ll be keeping a close eye on the matter.